What a collection! Music For Wartime has been on my radar for some time. It’s a collection of short stories and there’s not a dud in the bunch. Let me rephrase that. Each and every one has something to take away, to ponder, to question, to smile about. These 17 stories are not easy to describe or review. They can be read out of order and over any length of time. It took me almost a month to get through this 225 page collection, not because they were challenging to read but because they each could stand on their own, be put down and picked back up days later. Ann from Books on the Table has a great post interviewing Makkai here. 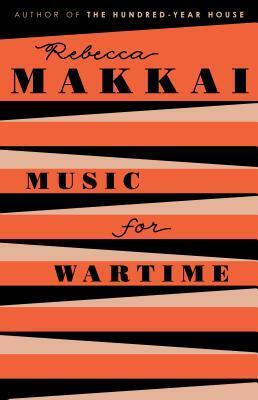 Music For Wartime by Rebecca Makkai was published June 23rd, 2015 by Viking and is 240 pages. I picked up a copy at my library. Tags: 2015 new release, Historical Fiction, Literary Fiction, Music For Wartime, Rebecca Makkai, short stories. Bookmark the permalink.